CGBSE 12th Class Results 2017: Chhattisgarh Board of Secondary Education(CGBSE) released the 12th Class Results 2017 on 27th April 2017. Students can get their results and marksheets from the website web.cgbse.net. Due to heavy traffic in the website candidates must try more than one time to get the proper website rendered and getting the complete result on the browser. It is adviced to use a moden browser from a computer than from a mobile phone. 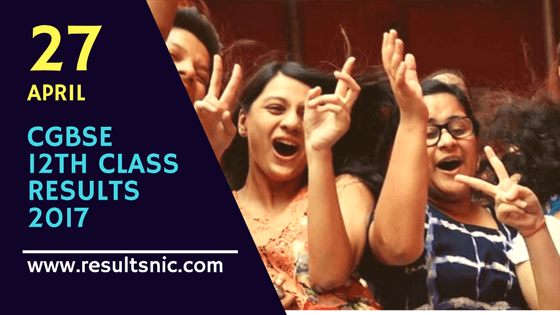 Direct Link to get CGBSE 12th Class Results 2017 is given below. CGBSE declared the class 10 results on April 21 where Chetan Agrawal from Kiran Public H S school Kurud Dhamtari school secured the first position with 98.17 per cent. The second rank was bagged by Vinita Patel from Saraswati Shishu Mandir High School Masturi Bilaspur with 97.67 per cent and Karan Sahu, Dewashish Patel, Aman Kumar shared the third rank with 97.33 per cent. Chhattisgarh Board of Secondary Education conducts Higher Secondary Examination (Class 11 and Class 12) Exams during the months of March and April. Exam centres of these examinations are spread across Chhattisgarh state. The Chhattisgarh Education Board does strict invigilation and quality evaluation of the answer sheets every year. After the Class XI & Class XII exams finish the evaluation process of answer sheets starts which takes 15 -20 days time. This could also go up to a month’s time if it is necessary for more detailed cross checks. Once the paper corrections are completed the CG Board officially declares the CGBSE 12th Results 2017. The CGBSE 12th Results are declared now. Students can get their results using their examination roll number on the official website.